A very warm welcome to all of you! It is a real pleasure to have so many friends with us today to mark the 40th anniversary of China’s reform and opening up, and to look forward to a new journey where China joins hand with the rest of the world to march forward. 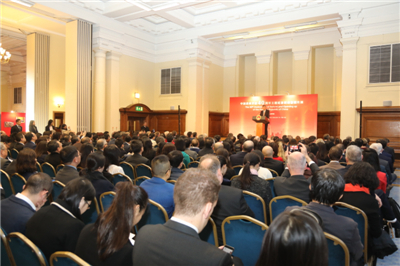 Please allow me to take this opportunity to express my sincere thanks to people from all walks of life who have supported China’s cause of reform and opening up and committed themselves to enhancing friendly cooperation between China and the UK! Forty years ago, Deng Xiaoming initiated China’s reform and opening up. The third Plenary Session of the 11th Central Committee of the Communist Party of China held in December 1978 marked the beginning of this historic journey. These 40 years have been a glorious chapter in the history of China. It is written with the pioneering, relentless and united efforts and unswerving dedication of the Chinese people. The past 40 years have many lessons for us. I think the following four lessons are most valuable. The first thing we have learnt is that fortune favours the brave and hard working. No pain, no gain. The people of China have made persistent and painful efforts over the past 40 years. As a result of these efforts, poverty is being gradually replaced by moderate prosperity, per capita disposable income has risen by 22.8 times, and 740 million people have been lifted out of poverty. Today we have with us a seamstress of the Miao ethnic group from the remote mountainous areas of Guizhou Province. She is a best illustration of China’s achievements in poverty reduction and improvement of people’s life. She and her fellow seamstresses have not only said goodbye to poverty but also traveled all the way form their remote mountain home to show the world the charm of China’s ethnic culture. As a result of the persistent efforts, China’s GDP has been growing at an average annual rate of 9.5% and increasing by 33.5 times. It now stands at $12 trillion. As a result of these efforts, China now accounts for 15% of the world GDP, compared to 2% forty years ago. It is the world’s second largest economy, biggest industrial country and largest trader in goods with the biggest foreign exchange reserve. These achievements are not a handout from others. They are the results of 40 years of hard efforts by the Chinese people. Therefore, when we assess the achievements of reform and opening up, we must not only look at how much the Chinese people have gained. It is also important to recognise the hard efforts they have made. The second lesson is that we must follow the trend of the times and keep reforming the old and embracing the new. Reform and innovation are the fundamental forces driving human society forward. In the past 40 years, we have liberated our minds and sought truth from facts. Liberation of the mind has led to reform and opening up, and the reform and opening up has in turn further emancipated the mind. This has been a mutually reinforcing interaction between innovative ideas and trials and errors. In the process, the enthusiasm, initiative and creativeness of individuals have been greatly stimulated. In the past 40 years, with undaunted courage and responsibility for self-perfection, we have kept improving socialism with Chinese characteristics and removing institutional and systemic obstacles hindering our development. These 40 years have seen China catching up and joining those in the forefront of the times. So, when we observe China’s reform and opening up, we must see it as the success of mutually reinforcing visionary ideas and concrete actions. The third lesson is, to borrow a Chinese motto, “The ocean is vast because it admits all rivers”. Openness brings progress and isolation leads to backwardness. In the past 40 years, China emphasized independent development as well as open and win-win cooperation. From establishing the Shenzhen Special Economic Zone to acceding to the WTO, from opening the coastal and border areas to developing the western inland region, from setting up pilot free trade zones to building the Belt and Road, China has taken a brave step into the world market. In the past 40 years, China has welcomed foreign businesses with open arms and vigorously explored access to the world. We have enhanced mutual learning and connectivity with other countries in the world in an open and inclusive attitude. The once closed and semi-closed country became one that opens up on all fronts. When we look at China’s opening up, we must not only see it as a wise decision for China’s economic development. It is also important to recognise China’s inclusive attitude towards the civilisations of other nations and countries. Let me quote Confucius to explain the fourth lesson we have learned from reform and opening up. That is, “To establish ourselves, we should help others establish themselves and deliver benefits to the whole world”. Reform and opening up is a great journey. On this journey, China and the rest of the world have achieved progress hand in hand. In the past 40 years, China has always shouldered its responsibility as a big country. It has played an important role in tackling the 1997 Asian financial crisis and 2008 international financial crisis. Its contribution to global growth has been more than 30% for many years in a row. It has been a stabiliser and powerhouse of world economy. In the past 40 years, China has always honoured its promises in its cooperation with other countries and acted in the interest of the world. Foreign companies have invested over $2 trillion in China, and China has become the largest trading partner of more than 120 countries and regions. The first-ever China International Import Expo held in Shanghai last month is yet another demonstration of China’s sincerity and resolve to open its market wider to the world. So when we assess the achievements of reform and opening up, we must not only look at China’s domestic development but also its enormous contribution to the world. Reform and opening up is an on-going process. China will not stop its steps. And China’s comprehensive national strength will continue to grow. Many people in the world may wonder: How will reform and opening up change China in the future? And what will these changes mean to the world? My answer is definite and clear: China will never seek hegemony as it grows stronger. Instead, China will remain committed to peaceful development, win-win cooperation and world peace, development and prosperity. These are not rhetorics. China has taken concrete actions to live up to these words. First, China has shared its visions with the world that reflect the trend of our times. In a globalised world, countries are all in the same boat and need to come to each other’s assistance instead of only minding one’s own business. They need to share weal and woe instead of pursuing interests at the expense of their neighbours. and to develop a fair and more reasonable global governance system. These visions are in line with the trend of safeguarding world peace and promoting common development. They highlight multilateralism, advocate fairness and justice in the world, and points to a future of greater human progress. Second, China has built an international platform for open cooperation and connectivity. China has proposed the Belt and Road Initiative. In the past five years, this Initiative has received warm response and enthusiastic participation. China has signed cooperation agreements on the BRI with more than 140 countries and international organisations. It has invested more than $86 billion in countries along the routes. And it has established in these countries 82 economic and trade development zones, which host 6,000 projects and has created more than 240,000 jobs. Next year, China will host the second Belt and Road Forum for International Cooperation. We welcome people from all walks of life in the world to participate in the Forum. I am confident that with the concerted efforts of all parties, the BRI will take root in more countries and bear more fruits. Third, China has created more opportunities for equal-footed and mutually-beneficial cooperation. In the coming 15 years, China plans to import $24 trillion of goods, open up a 2-trillion-dollar market to foreign investors and invest $2 trillion overseas. Chinese tourists will make more than 2 billion overseas visits. Going forward, China will continue to deepen its integration with the world in order to achieve better development at home and at the same time share the benefits of its own development with other countries. Fourth, China has displayed the courage to shoulder its responsibilities as a big country. In a world with increasing instabilities and uncertainties, China will continue to do what a big country should do, namely, shoulder more responsibilities for regional and world peace and development. China will continue to make new and greater contribution to mankind, uphold the open world economy and multilateral trade regime, and oppose protectionism and unilateralism. China will take an active part in global governance, and support the developing countries in having a greater representation and bigger say in international affairs. At the same time, China will remain committed to peaceful development at home and forge partnerships around the world. World peace and better life for the people are always our top priorities. A great cause calls for great actions. 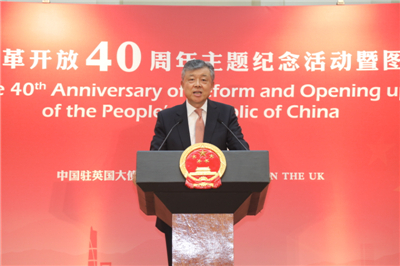 Over the past 40 years, the international community, including the UK, have given their support for China’s reform and opening up and taken an active part in it. Their actions have been instrumental in the success of this great cause. China-UK relations, after 40 years of leaps-and-bounds, is a best illustration of China’s deep integration with the world. Going forward, China plans to deepen reform and open its market wider to the world. This matches well with the UK’s goal of building a “global Britain”. Such synergy will open up broader space and create more opportunities for the cooperation between our two countries in various areas. How to seize these opportunities and deepen China-UK cooperation is an important issue to be addressed by people from all walks of life in both countries. In my opinion, we should do the following. First, China and the UK should view each other’s development with a rational attitude. Our two countries should always look at our bilateral relations from a long-term and strategic perspective. We should see each other’s development as opportunities rather than challenges or threats. We should refrain from undermining each other’s core interests or our strategic mutual trust. The only way to keep our bilateral relations on the right track is to respect each other’s core interests, major concerns, sovereignty and territorial integrity. We must bear the larger picture in mind, address differences properly and enhance political trust so as to ensure that the building of China-UK relations stands tall and firm. Second, China and the UK should promote business cooperation in the spirit of partnership. Our two countries should match our development strategies and enhance policy coordination. While deepening cooperation in traditional areas, we need to explore opportunities in new industries and new models. We should tap the potential in our cooperation in the areas of economy, trade, financial services, energy, science, technology, culture and people-to-people exchanges and translate our complementary advantages and development opportunities into concrete outcomes. 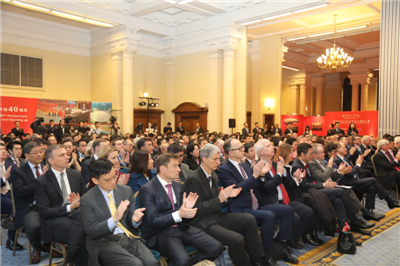 In Belt and Road cooperation, the UK is a “natural partner” of China, to quote Chancellor Philip Hammond who attended the Belt and Road Forum for International Cooperation as the personal envoy of the Prime Minister. The second Forum scheduled for next year will offer a great opportunity. Our two countries should seize this opportunity to expand and deepen our cooperation on the BRI and achieve new highlights in the business cooperation between our two countries. Third, China and the UK should address global challenges with an open mind. As important members of the UN, G20 and WTO, China and the UK shoulder special responsibilities for world peace and development. It is important that our two countries stand against protectionism and work together to build an open world economy. In promoting reforms of the global governance system, we should strengthen rule-based global governance and oppose expediency and double standard. While promoting trade, investment, IPR protection and cooperation on digital economy, we should create more opportunities and space for the common development of all countries in order to provide strong impetus and a stable environment for world economic growth. Looking back at our success over the past 40 years, we are convinced that the Chinese Dream of national rejuvenation will come true as we press ahead on the new journey of reform and opening up. Going forward, we will continue to advance in the spirit of reform and innovation, and with the courage to overcome all the difficulties ahead. And we are ready to join hands with the UK and other countries to seize the opportunities of cooperation and share development benefits. Working together, we can build a community with a shared future for mankind!